Healthy After School Snacks: Want your kids to make healthier choices? These are snacks that kids actually WANT to eat, yet are healthy enough parents feel good about serving them up to their children. This is typically the first statement out of my children’s mouths as they rush into my arms after school. Well, at least they are hugging me when they say it, right?! Guess what? It isn’t going to happen. I have come to that realization. I am blessed with children who have huge hearts who love to snuggle me, hug me, and share with me. But when they get home from school it is their bellies that begin growling at me through their words! 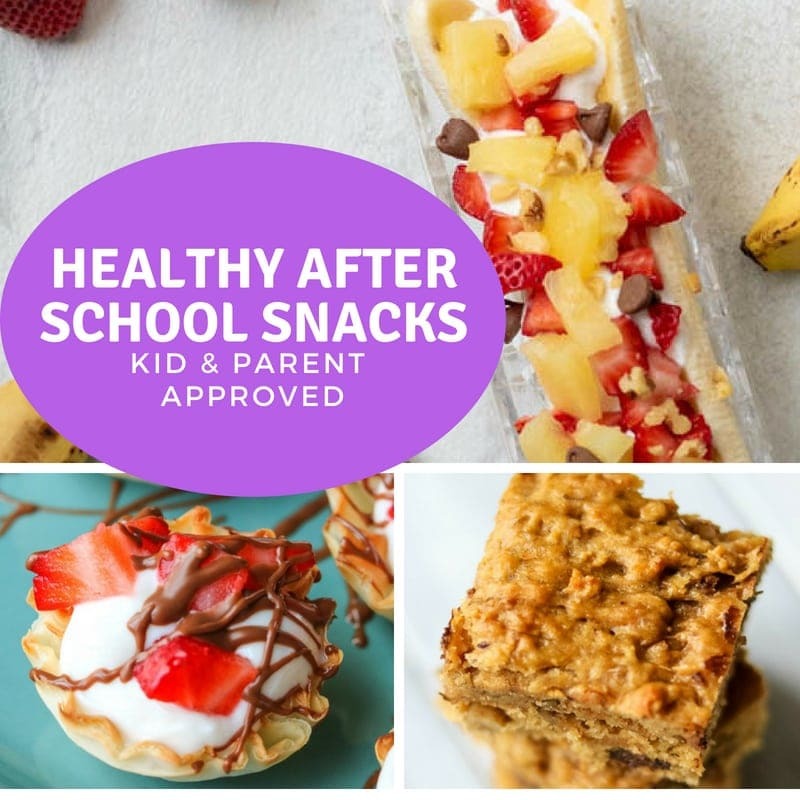 I have learned to be prepared with an arsenal of healthy snacks ready and waiting for them to welcome them home from the day, I also aimed with conversation topics–so I can actually find out about their school day too! My number one piece of advice when selecting a snack, is to try to keep it balanced. Pair a whole grain carb with protein and healthy fat. But snack time is also an opportunity to reach dietary goals for the day. No veggies at lunch time? What about a slice of Zucchini bread or fresh veggie sticks with hummus? Need a dose of dairy? Try yogurt topped with fresh fruit or nut butter. Or maybe sliced cheese with fresh fruit. Haven’t had a treat in awhile? Surprise your children with some freshly baked cookies. Don’t think of snacks as just fillers, think of it as an opportunity to nourish your growing child. After all, most children eat better at snack time than at meal time. Smoothies are a huge favorite at this house. I can stuff them full of nutrients, yet make them taste like a decadent dessert. Muffins are not only a great choice for breakfast or packed into lunch, but also make a wholesome after school treat, especially when paired with a glass of milk and some fruit. In case your child is not in the mood for a bar, muffin, or smoothie, here are some more great options that are proven to be great choices for kids. Great ideas! I need healthy snack ideas for myself, too! Thanks! Thank you! These snacks are perfect for all ages!!! What a great roundup of snacks, just in time for the start of school! Thanks so much for sharing with Full Plate Thursday and have a great weekend! Great list of ideas, Kristen! Perfect list, so many ideas, I love it! Thank you for linking up to the Bloggers Brags Pinterest Party. I have pinned your post to the Bloggers Brags Pinterest board. I’m always looking for great snacks. Your post is pinned to our pinterest board. Thanks for linking up at Creative K Kids Tasty Tuesday! Thanks Dina! I hope you find this list of snacks helpful. I have it posted on my fridge for a quick reminder to myself!! Awesome post. Thanks for sharing these delicious and tempting recipes as my daughter always demand a different type of snacks after coming from school and with the help of your post I can make various recipes for my daughter and family. Keep sharing such great recipe ideas. Thank you so much Supriya! Glad that these healthy snacks inspire you!